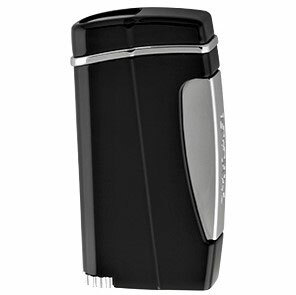 Xikar Executive Lighter Black,This design places the trigger along the body of the lighter so one?s finger no longer needs to be perilously close to the flame (goodbye burned fingertips!) The oversized adjustment wheel ensures a quick flame adjustment for any occasion. A simple push on the side of the lighter simultaneously opens the lid and ignites a powerful windproof flame perfect for cigars, cigarettes or that campfire that needs a little encouragement.